Icicles and ice dams form when snow melts on a warm roof surface and refreezes once the snowmelt hits the roof’s colder eaves. Helmet Heat reduces this process by raising the gutter temperature above freezing. This protects your roof, gutters and downspouts from heavy snow and ice loads that can lead to ice damage and frost erosion. The Helmet Heat system uses self-regulating heating cables, meaning the cable itself detects changes in ambient temperature and responds accordingly. Our cables cannot overheat and are GFCI (Ground-Fault Circuit Interrupter) protected. 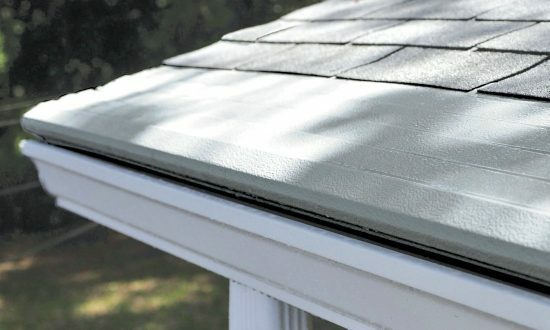 Unlike other heat cables, Helmet Heat provides just enough heat to keep your gutters warm and melt the ice, but not enough to make the cables hot to the touch. Our cables have two parallel nickel-coated copper bus-conductors that serve as the heating element. In between them is an extruded radiation cross-linked polyolefin conductive core. When ambient temperature drops, the number of electrical paths through the core increases, producing more heat. The opposite happens when ambient temperature rises. Because Helmet Heat is self-regulating, neither a thermostat nor constant monitoring of the system is necessary. The construction and technology of our heat cables make them a safe and practical de-icing solution for your home. The cables are hidden underneath your Gutter Helmet® gutter covers, keeping them invisible and protected from accidental damage. To get years of hands-free, worry-free protection, ask your local dealer about Gutter Helmet and Helmet Heat. Fill out our contact form or call (800) 824-3772 to schedule a free in-home estimate today.